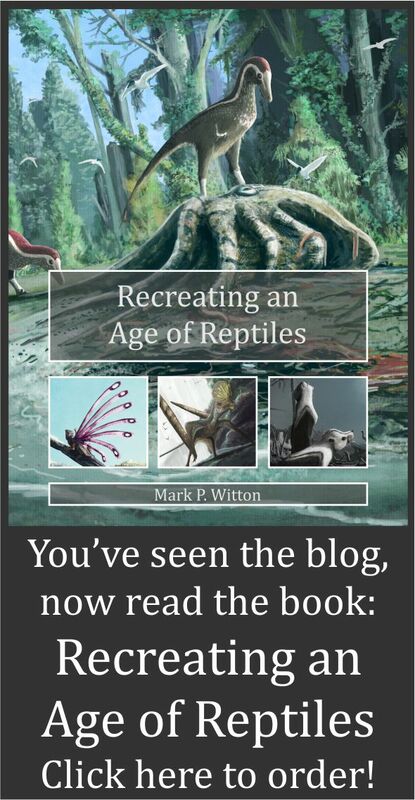 Mark Witton.com Blog: The abundant, apocalypse-surviving, rocket-propelled Valdosaurus: Britain's most interesting dinosaur? The abundant, apocalypse-surviving, rocket-propelled Valdosaurus: Britain's most interesting dinosaur? Two Wealden dryosaurids Valdosaurus canaliculatus, argued below to be striking and exciting animals that we should all be enthused about, shown here milling about a Lower Cretaceous woodland, not doing very much. Prints of this image are available here. The wide interest palaeontology receives is largely because many fossil animals are spectacularly charismatic, their popularity enhanced by large body size and terrific anatomical features. Not all fossil animals are well adorned with attention-grabbing anatomy, of course. Some animals, even those belonging to particularly famous groups like marine reptiles, pterosaurs or dinosaurs, are devoid of immediately-striking features and proportions, and may be so 'average' that they rarely receive dedicated attention outside of technical literature. Step forward the most middling, most average and downright beigest of all ornithopods, the dryosaurids. Mounted skeleton of the Jurassic dryosaurid Dysalotosaurus lettowvorbecki in the Humboldt Museum's excellent dinosaur hall. Photo by Masur, from Wikimedia Commons. Beige. The Jurassic-Cretaceous clade Dryosauridae contains animals which, at first glance, represent the mean of dinosaur extremes. Most of these animals, early offshoots of the ornithopod group Iguanodontia, are small or medium-sized, at 3-4 m long. They have fairly short, unremarkable ornithopod skulls and small grasping hands which are, well, quite a lot like those of other small-ish ornithopods. They possess no horns, claws or even particularly arresting teeth, their jaw tips being entirely toothless and cheek teeth, as with most ornithopods, being leaf-shaped and coarsely serrated. This restricted them to a diet of leaves and other herbage, and there's not even any strong hints of omnviory. In short, they aren't especially cute, aren't really spectacular, and, to look at one, it's hard to find a truly distinctive, memorable feature. Perhaps this is why the only time they're given decent palaeoartistic renditions is when they're being pursued by a more striking theropod, and are relegated to bit-parts and cameo roles in most dinosaur books and palaeodocumentaries. As usual, appearances can be deceiving. There's actually a lot more going on with these dinosaurian plain Janes than casual glances may suggest. If you stare at a skeleton of a dryosaurid long enough, the pronounced difference in their fore and aft proportions becomes inescapable. The head, neck, forelimbs and torso belong to much smaller dinosaurs than their legs and tail, which are proportionally much longer and more robust than we'd expect from their anterior skeleton. This enlarged posterior region does not seem to reflect expansion of the gut either, as it does in some other herbivorous dinosaur species. Rather, the pelvic bones betraying the depth of the belly are fairly shallow, suggesting the legs and tail are long for the sake of being long, not to accommodate increased body size or torso girth. Of further note are dryosaurid feet, which are not only surprisingly long and gracile but also possess a mere three toes, a contrast to the primitive ornithopod condition of four. Their femora have a very long, finger-like fourth trochanter (the variably shaped process on the posterior surface of dinosaur femora which anchored posterior hindlimb muscles) and a very large and prominent scar occurs where the famous caudofemoralis musculature anchored to the thigh. As in all dinosaurs, this muscle ran to the anterior portion of the tail (discussion here), the elongation and deepening of which permitted a great deal of room for its attachment. Put together, these femoral and caudal features are clear indicators of large hindlimb retractor muscles and, along with the svelte body and long legs, betray the habit of very rapid running. Indeed, the cursorial features of dryosaurids are so marked that they were probably among the swiftest of all ornithischians, a trait which may explain their conspicuous lack of ornament, armour and weaponry compared to other dinosaurs. Such elaborations are not without use of course, but they are just extra weight for a running animal. Thus, rather than thinking of dryosaurid skeletons as boring, we should view them as the bones of lithe, streamlined, athletes. I wonder if we'd consider these animals dinosaurian Mr. Averages if we could see them in life, their running abilities likely making them very striking and conspicuous animals in many Jurassic and Cretaceous ecoystems. Dryosauridae was a widespread group with fossils occurring in Africa, Europe, North America and New Zealand. One British dryosaurid, the Wealden Supergroup taxon Valdosaurus, has become particularly interesting in recent years. Bones ultimately referable to this genus were described from the Wessex Formation, Isle of Wight, as early as 1888 by Richard Lydekker. They were not recognised as being Dryosaurus-like until the 1970s however, the decade which also Valdosaurus canaliculatus receive its name (Galton 1977). A second Valdosaurus species was erected for Nigerian material by Galton and Taquet (1977), but has since been moved to its own genus, Elrhazosaurus. 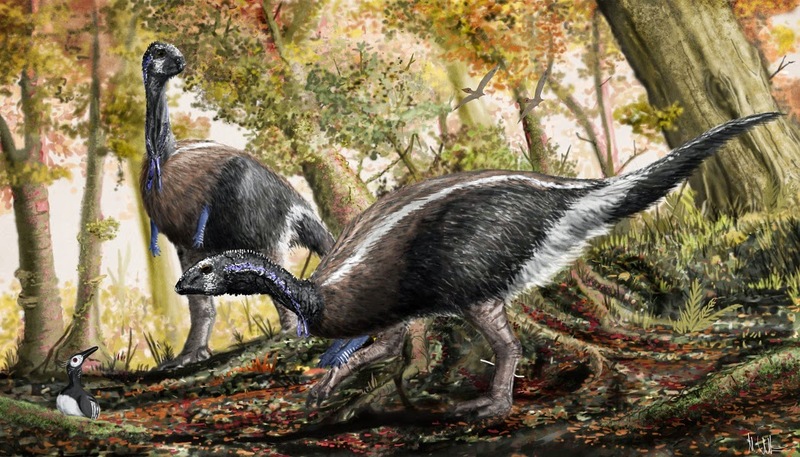 It took a while to appreciate that dryosaurids were a unique radiation of ornithopods rather than merely oversized versions of Hypsilophodon, with the first inclinations of this idea only appearing in the 1980s. Somewhat surprisingly, the monophyly of Dryosauridae was untested for many decades, but has recently been borne out under phylogenetic analysis (e.g. McDonald et al. 2010; Barrett et al. 2011). Alleged Valdosaurus material from Spain and Romania seemed to extend the range of this animal across Europe, but these referrals have not withstood scrutiny: Valdosaurus remains UK-only for the time-being. Holotype femur of Valdosaurus compared to those of other small ornithopods. Note the size of the scar for M. caudofemoralis, 'p', in Valdosaurus. Figure and caption from Galton and Taquet 1977. As usual for a Wealden dinosaur, Valdosaurus isn't known from a huge amount of material. Various bits and pieces have been referred to this taxon for decades but, like many other British dinosaurs, recent work has tightened up what can and cannot be referred to it (Barrett et al. 2011). We now consider Valdosaurus known primarily from hindlimb and pelvic remains, along with some vertebrae and portions of the pectoral girdle. These remains suggest Valdosaurus was a large dryosaurid with a body length of about 4 m, and a particularly well-distinguished, large caudofemoralis muscle scar on its femur (Barrett et al. 2011). Does this mean it had a particularly big set of hindlimb protractors and was especially fleet-footed? Maybe, but it's hard to say in the absence of more complete specimens. Still, assuming the rest of its proportions were like those of other dryosaurids, it was probably the fastest ground animal in the Wealden Supergroup and capable of outrunning any contemporary predator. What makes Valdosaurus especially interesting and unique among Wealden dinosaurs is its longevity. The Wealden dinosaur fauna is essentially divided into two groups: a 'lower' and 'upper' assemblage. The 'upper' contains the most widely known taxa, animals such as Iguanodon, Polacanthus, Baryonyx, Hypsilophodon, Neovenator and the like. These animals occur in rocks dating to the Hauterivian and Barremian, about 133-125 Ma. The 'lower' fauna features slightly lesser known taxa: Barilium, Hylaeosaurus, Pelorosaurus and so on, all of which are of slightly older, late Berriasian-Valangian vintage (138-133 Ma). The transition between these faunas is not continuous, with a series of poorly-fossiliferous Hauterivian-aged strata - representing about 4 million years - occurring between more productive Wealden rocks. William Blows has proposed across several papers that this gap may not merely be an artefact of sampling (although this remains possible), but a low-level extinction event that wiped out the 'lower' fauna and allowed the 'upper' assemblage to repopulate (e.g. Blows 1998). Not all agree that this apocolyptic interpretation is the most likely explanation of the Hauterivian Wealden dinosaur gap - some argue that we just need to look harder for more bones. Whatever, something clearly caused a lot of upset for the Wealden dinosaur fauna in the Hauterivian, resulting in significant reorganisation of dinosaur faunas by late Hauterivian-Barremian stages: old taxa disappeared, and new ones - sometimes entirely different clades - replaced them. How does Valdosaurus fit into this? Although classically part of the 'upper' Wealden assemblage, Valdosaurus is now known to occur in the 'lower' fauna (e.g. Blows 1998; Naish and Martill 2008; Barrett et al. 2011). This makes it the only dinosaur to span the Hauterivian gap, suggesting it lived through whatever turned out the older Wealden dinosaurs and brought in the new. It must be stressed that the older Valdosaurus remains are not terribly complete and may not be V. canaliculatus proper, but they are extremely similar to Valdosaurus remains from the 'upper' Wealden and at worst, they represent a very close relative, perhaps a direct ancestor. Of further interest here are recent reconsiderations of Valdosaurus/dryosaurid abundance within the Wealden. Dryosaurs were once considered rare in these deposits, but ongoing appraisals of British Lower Cretaceous dinosaurs suggest they were far more abundant than once realised, and populous enough to question the dominance of iguanodonts in Wealden herbivore palaeoecology (Barrett et al. 2011). Given that Valdosaurus represents a good chunk of the Wealden dryosaur material, we may take this as a sign that it was not only a long-lived taxon, but also one that had a strong foothold in Wealden habitats. The longevity and abundance of Valdosaurus may see it being considered one of the greatest 'success stories' of Britain's Lower Cretaceous dinosaurs, and the implications of its success to Wealden palaeoecology undoubtedly make it one of the more interesting members of the assemblage. A key question - why did it persevere when all other species didn't? - now hangs over this unassuming animal's head. With work on the Wealden fauna constantly ongoing, it seems like a case of 'watch this space' to see just how our new perception of Wealden dryosaurids will influence broader interpretations of Britain's Lower Cretaceous dinosaurs. Exciting times indeed, then, and a far cry from the perception of Valdosaurus and dryosaurids as easily-forgotten, 'average' dinosaurs: at least one of them is, from a certain perspective, one of the most interesting dinosaurs in the UK. Barrett, P. M., Butler, R. J., Twitchett, R. J., & Hutt, S. (2011). New material of Valdosaurus canaliculatus (Ornithischia: Ornithopoda) from the Lower Cretaceous of southern England. 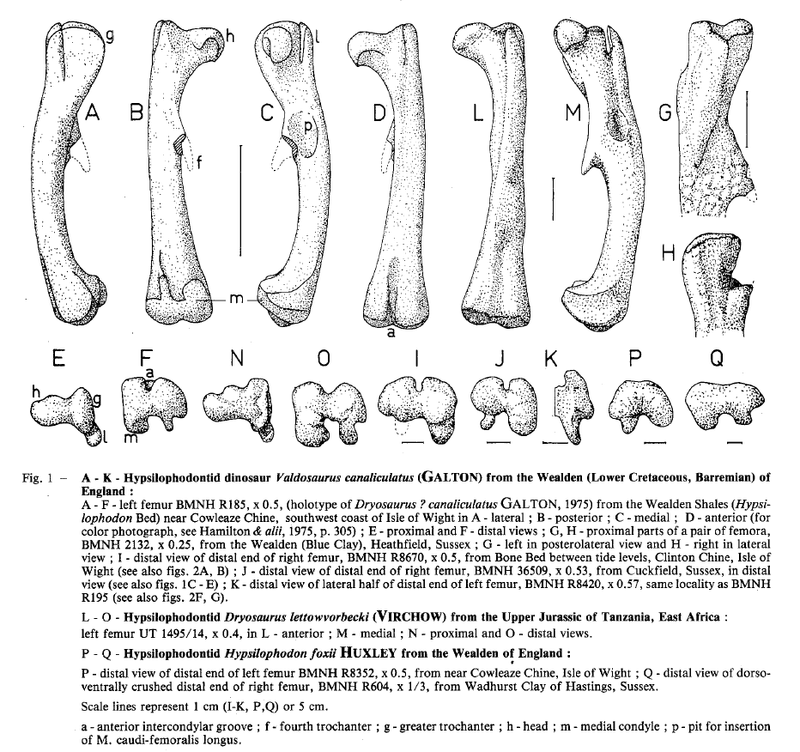 Special Papers in Palaeontology, 86: 131–163. Blows, W. T. (1998). A review of Lower and Middle Cretaceous dinosaurs of England. New Mexico Museum of Natural History and Science Bulletin, 14, 29-38. Galton, P. M., & Taquet, P. (1982). Valdosaurus, a hypsilophodontid dinosaur from the Lower Cretaceous of Europe and Africa. Geobios, 15(2), 147-159. McDonald, A. T., Kirkland, J. I., DeBlieux, D. D., Madsen, S. K., Cavin, J., Milner, A. R., & Panzarin, L. (2010). New basal iguanodonts from the Cedar Mountain Formation of Utah and the evolution of thumb-spiked dinosaurs. PloS one, 5(11), e14075. Naish, D., & Martill, D. M. (2008). Dinosaurs of Great Britain and the role of the Geological Society of London in their discovery: Ornithischia. Journal of the Geological Society, 165(3), 613-623. I quite agree that dryosaurids are actually fascinating creatures. Another interesting and as yet unanswered question is whether they survived in North America into the Early Cretaceous. Dryosaurus itself is known from the quarry at Dinosaur National Monument in Utah, one of the stratigraphically highest sites in the Morrison, but that's the last we see of them in North America. Were they replaced in NA by tenontosaurs? If so, where did those come from? Perhaps the ongoing explosion of dinosaurs from the Cedar Mountain Formation will include the answers. There is "Hypsilophodon" wielandi from the Lakota Formation, which has been touted as a dryosaurid in the past but more recently has been considered an indeterminate ornithopod (Galton 2009). Thanks for the comment and info, Andrew. Coming from a research background in animals which have a rather poor fossil record, I find it very interesting to read and write about animals where their absence can be seen as potentially significant, rather than just another point in their distribution. Darren is rubbing off on you! Your doing more wealden then pterosaurs. Actually, my interests in the Wealden pre-date my interest with pterosaurs, as evidenced by this rather old set of drawings. My undergraduate dissertation focused on the Wessex Formation, so I caught the bug then. Polacanthus now spans both biozones, upper and lower, with a partial Polacanthus from the Valanginian of Sussex (paper in press). Cool - thanks for the info, William. Will keep an eye out for the paper. For a second there I thought you were going to announce a non-avian dinosaur that survived THE apocalypse... I was thinking... What? Alas, my hopes are seriously miss-placed.